||||| WELCOME TO THE ROSARY WORKSHOP SHOPPING CART (store.rosaryworkshop.com). You may access any of the 1000 + items on sale by using the STORE SECTIONS (left), and if you wish to learn more about the product or order, just click the image. ||||| SECURITY ISSUES are always concerning. No persdonal information (credit ccards) are kept online and are deleted once order has been secured. SEARCHING FOR SOMETHING SPECIAL? Use ADVANCED SEARCH (upper right corner) for special medals, rosaries, chaplets, Wild Goose Studio (Ireland), Work by Vatican artist, Egino Weinert (Germany) along with special bead artists. ROSARIES, CHAPLETS and JEWELRY: All are designed by and for the Rosary Workshop Museum Gallery Shop. We specialize in rare antique beads, semi precious stones, pearls and other hard to find beads. We string our work on a state of the arts wire (49 strands of stainless steel) which is very strong but supple allowing for it to be passed on from generation to generation. METAL PARTS: All crosses, crucifixes and religious medals are hand cast from antiques and vintage pieces in sterling silver and solid bronze then antiqued to restore original patina. The Rosary Workshop is the sole retail distributor on the internet for these hand-cast parts. BE SURE TO VISIT OUR MAIN SITE (rosaryworkshop.com) to see the ROSARY MUSEUM, HISTORY of the ROSARY (Journaling the Bead), PRAYERS, SERVICES (how to make a rosary) and many other interesting things. To return to this page (shopping cart) click TO ORDER on any product. TO IDENTIFY ITEMS BELOW DRAW ARROW (cursor) slowly over image and title will appear. To read more about item, to order click image for pricing. 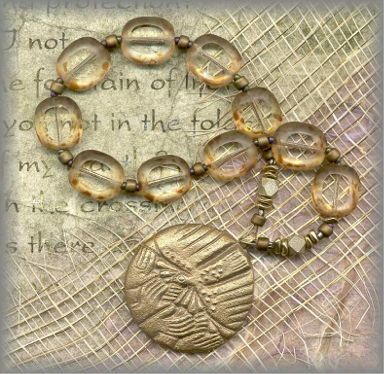 12 + CHAPLETS INSPIRED BY MUSEUM PIECES - Seeking out the old brings inspiration forward to today. These 'ZEHNERS' are rare and lovely, inviting one to prayer. 5 + HEART of the MOTHER CHAPLETS - Dedicated to moms, brand new moms, grandmoms, all moms who have given so much to you! and me - a great reminder of our love and appreciation! 21 + TRADITIONAL 'NINER' CHAPLETS - traditional 3 sets of 3 beads (Ave, Pater, Glory). Each chaplet has a saint's medal. called to be the intercessor of the prayers said. Also for Novenas! 20 + BEAUTIFUL BRONZE WORKS of ART - SAINT'S (9 beads) - by Egino Weinert, world renown Vatican artist. 9 rare & beautiful beads for 'niner' prayers, Gloria, Pater, Ave 3 times. Also for Novenas. 8 + IRISH PENAL CHAPLETS - These 10 beads ('tenners') reflect the Penal Times (17 - 1800s.) a rough period of history for Catholics. Chaplet is enjoying new interest. 1 + LIMITED EDITION CHAPLETS using Antique Beads. A rare and very limited series of chaplets using a collection of beads from various origins and eras. 12 + 'OCEAN TUMBLED' CHAPLETS (two window beads) - These beads appear as glass that has been tumbled in the ocean. Called '2 windows' design from old beads molds. Very prayable in the hand. 29 + ROSARY WORKSHOP SPECIAL CHAPLETS - 10 bead chaplets ('tenners') - some of our very favorites designed especially for us. Pray it 5 times and you have prayed the rosary. 52 + CHAPLETS - COMMUNION OF SAINTS - chaplets dedicated to saints with special counts and devotions for intercession for needs in our lives. Very special.